High affinity and selective p38 kinase inhibitor (Kd = 50-100 pM). 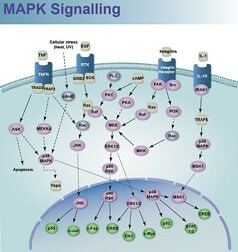 Exhibits no significant inhibition on a panel of related kinases. Inhibits LPS-induced TNFα production in human PBMCs and whole blood (IC50 values are 21 and 960 nM, respectively). Also inhibits JNK2α2 and c-Raf-1 (IC50 values are 98 nM and 1.4 μM, respectively). Cell permeable. The following data is based on the product molecular weight 527.66. Batch specific molecular weights may vary from batch to batch due to the degree of hydration, which will affect the solvent volumes required to prepare stock solutions. If you know of a relevant reference for BIRB 796, please let us know. Currently there are no citations for BIRB 796. Do you know of a great paper that uses BIRB 796 from Tocris? Please let us know. There are currently no reviews for this product. Be the first to review BIRB 796 and earn rewards! Have you used BIRB 796?